On the day after the Barcelona MotoGP race, the entire grid bar the Aspar Ducatis were back at the track for a full day of testing. Conditions were ideal; so ideal that they perhaps a little confusing. 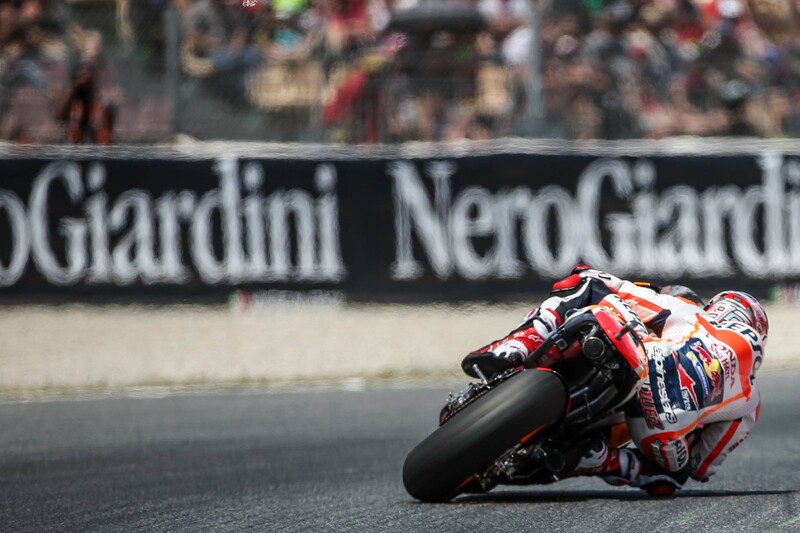 Though it was hot and dry, the fact that only MotoGP bikes are circulating and laying down Michelin rubber meant the track felt different to race day, when the MotoGP bikes have to follow Moto2, and cope with the Dunlop rubber the fat rear tires smear on the track. The grip was also helped by the fact that Michelin had three new rear tires to test. They were three slightly different versions of construction of the current rear tire, using one of the compounds available for the race weekend. The tires were well-received, everyone praising the added traction the tire offered. The only criticism offered was that they had a very short life, dropping off after two or three laps. Michelin were pleased with the results of testing. The main aim of the new tires had been to proved extra traction, and that is what they had delivered. Michelin chief Nicolas Goubert was very satisfied. “All three tires were better than the reference tires, so we just have to choose which one to make.” The tires were very much test items, used to gather data, and were to be taken away and examined back at the factory. On Friday, a young man died in a freak crash at the Circuit de Catalunya, and we mourned him. On Saturday, we went through the motions, picking up the rhythm of a normal race weekend, but in a state of mild shock. On Sunday morning, we remembered Luis Salom, the whole paddock and a circuit full of fans standing in silence, united both in the memory of a bright young talent who take took from us, and in the knowledge that it can happen again. On Sunday afternoon, we raced, and reminded ourselves of why young men and women risk their lives with the frankly rather futile objective of demonstrating that they can ride in circles on a motorbike faster than anyone else. Marc Márquez felt much the same. 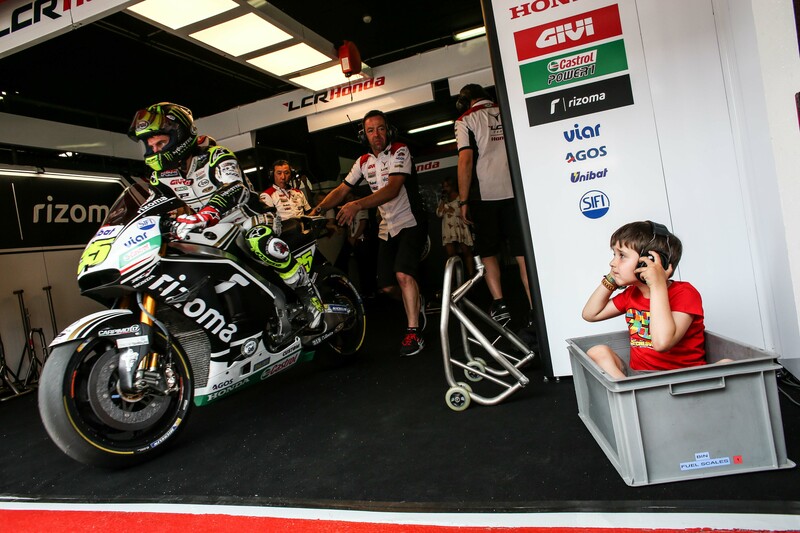 “In the end also this Sunday, I liked it was again the atmosphere of the family, the MotoGP family. Because when we were there together on the grid, when we were racing, everybody was racing for Luis. Everybody dedicated the race to Luis.” And what races to dedicate to Luis Salom. The Moto3 race saw a tense battle go down to the line, and a thrilling finale and a win that had been a long time coming. 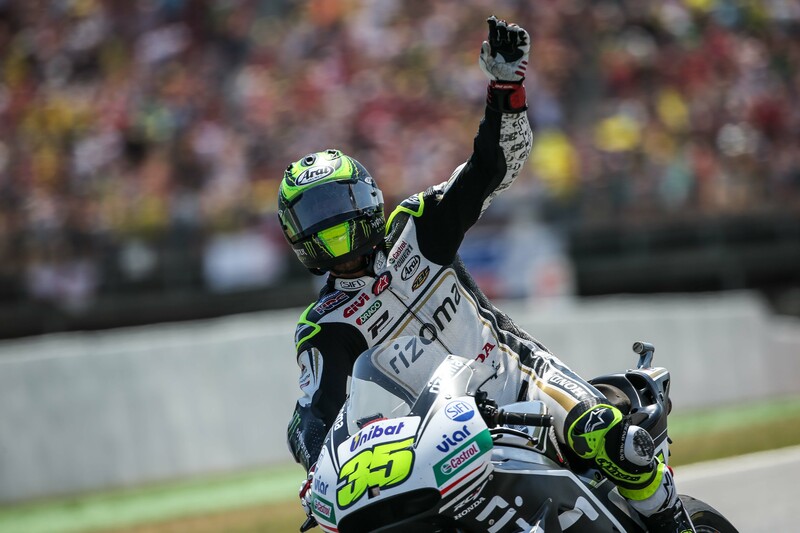 The Moto2 race became a brawl between two of Salom’s recent rivals, with a masterful display to take victory. 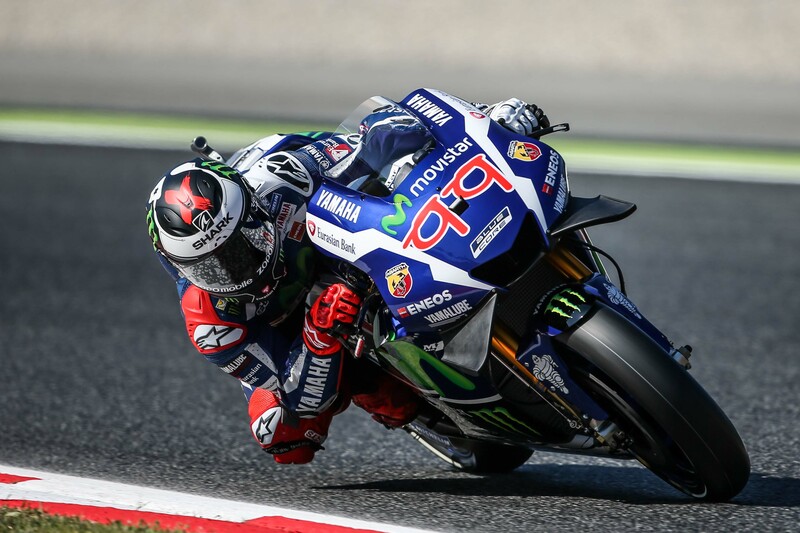 And MotoGP produced one of the fiercest duels we have seen in a while, a popular victory, and a shake up in the championship. What does the MotoGP paddock do the day after a rider dies? Carry on as normal. Or nearly normal: bikes circulate, riders compete, but conversations are more hushed, the mood muted. The whole paddock is a quieter place, bar the bellowing of racing four-stroke engines. Heartless? That is putting it a little strongly. It is in part a coping mechanism, immersing yourself in your work to avoid dwelling on tragedy, and thinking too much about danger. But it is also a response to the request of Luis Salom’s family and team. When Dorna boss Carmelo Ezpeleta asked them what they wanted to do, they said they wanted the race to go ahead. Their wishes would be respected, but it was not the first choice of everyone in the paddock. Danilo Petrucci told the Italian press he would have preferred to have packed up and gone home, and he was not alone. “Yesterday I was crying together with my brother because [Luis Salom] was really young,” Aleix Espargaro told us. “This is a disaster. With Pol we were thinking that the best thing was to not race because actually now I feel empty inside.” We all felt empty inside, and still do. “MOTORSPORTS CAN BE DANGEROUS” it says on the back of my media pass, the hard card I wear around my neck and which gives me access to the paddock and the media center. It says the same thing everywhere around the circuit: on rider passes, on the back of tickets, on signs which hang on fences around the circuit. You see it so much that it becomes a cliché, and like all clichés it quickly loses its meaning. Until reality intervenes, and reminds us that behind every cliché lies a deep truth. Friday brought a stark reminder. During the afternoon session of free practice for the Moto2 class, Luis Salom exited Turn 11 and got on the gas towards Turn 12. Just before the turn, traveling at around 170 km/h, the rider caress the front brake to help the bike turn through the fast right hander of Turn 12, an engineer told me. At that point, Salom lost control of his bike, fell off, and he and his bike headed towards the air fence which protects the wall there. 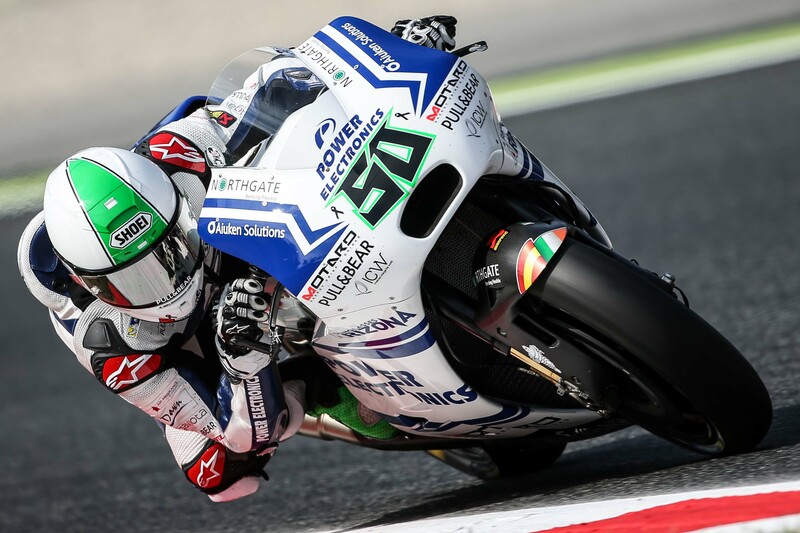 They slid across a patch of tarmac put in to help the cars if they run straight on at that corner, and Salom’s bike hit the air fence and wall, careened off the wall and into Salom, fatally injuring him. Salom received treatment in the corner, and was then taken to a local hospital where doctors did all they could to save his life. Sadly, they could not. Luis Salom died at 4:55pm on 3rd June 2016, at the age of 24. After the tragic death of Luis Salom, as a result of injuries sustained in a crash during Moto2 FP2, the track layout is to be modified for the remainder of the MotoGP weekend. The event is to continue, in accordance with the wishes of the family of Luis Salom, as well as the riders and teams. The track configuration is to be changed, and the riders in all three classes will use the layout used by Formula One, which has a much sharper corner at Turn 10, the rounded corner being replaced with something approaching a hairpin. Now instead of the flowing into Turn 12, riders will also use the chicane that replaces it for F1, adding a tighter right-hander followed by a sharp left-right combination. The new layout is shown in a graphic above. To allow the riders to get accustomed to the new layout, all three classes will be given 15 minutes extra track time in FP3. This means that FP3 will start at 8:40am for the Moto3 class, and last until 9:35am. MotoGP FP3 will run between 9:50a, and 10:50am, while Moto2 FP3 will take place between 11:05am and 12:05pm. It is with a heavy heart that we have to report that passing of Luis Salom, who crashed tragically today during the Moto2 FP2 session at Catalunya. 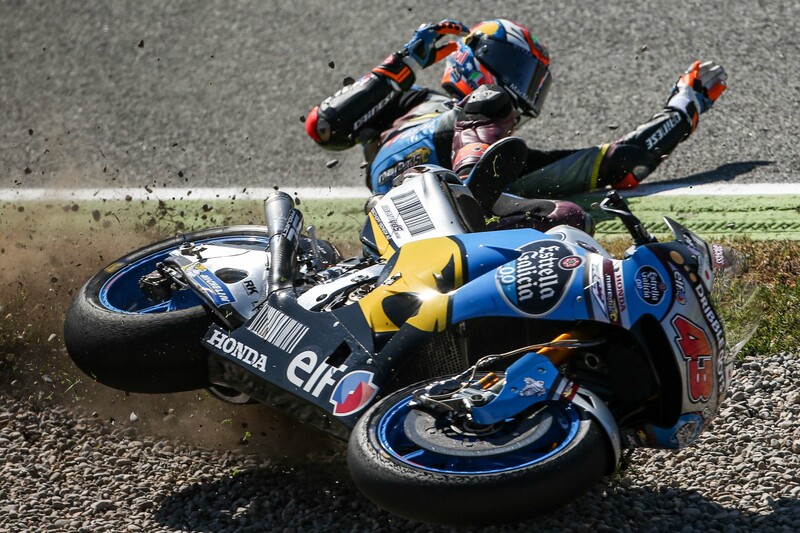 The incident occurred at Turn 12, a fast corner that is the second-to-last turn for motorcycles on the Catalan circuit. The crash is still being investigated, and a great deal of speculation is still coming from the MotoGP paddock, but security camera footage of the incident shows Salom sliding after his bike sliding, at great velocity, over the F1 runoff and into the air fence at the turn. Salom was treated by medical personnel trackside for a lengthy duration of time before being transported by ambulance to the Hospital General de Catalunya in Sant Cugat del Valles, where he later succumbed to his injuries at 4:55pm, local time. He was 24 years of age. Ride in peace, Luis.